What is a Chesty Cough & what causes it? Coughs are reflex actions designed to clear the body' s airways of mucus and irritants. Coughs are rarely a sign of anything serious and in most cases, they clear up within three weeks without the need for treatment. Chesty coughs are sometimes referred to as productive coughs. This type of cough means that mucus is produced to help clear the airways. Chesty coughs are usually caused by a build-up of phlegm in the lungs, which results in chest congestion. Chest congestion is a common symptom of a respiratory tract infection, which can be caused by irritants, viruses or bacteria entering the lungs. Rarely, a persistent chesty cough can be caused by a more serious underlying condition, such as lung cancer, heart failure, pulmonary embolism or tuberculosis. If a cough has lasted more than three weeks, or if it starts to get worse instead of better, it is recommended that you contact a GP. 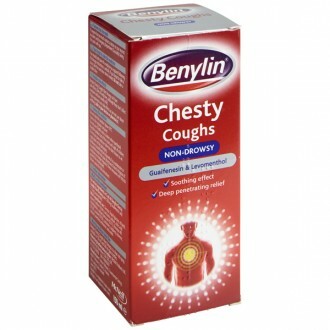 What are the symptoms of a Chesty Cough? Persistently coughing up a yellow/green phlegm. A sore throat – this is usually caused by the excess mucus irritating the throats lining. Mild chest pain – this is due to the muscles in the chest becoming strained and bruised through excessive coughing. Muscular pain in the abdomen – as with mild chest pain, coughing can strain the muscles in the abdomen as well. How is a Chesty Cough diagnosed? The cough has lasted for longer than three weeks. The cough is particularly severe or seems to be getting worse. The cough is causing breathing difficulties. You are experiencing chest pain. You are coughing up blood. If there are any additional unexplained symptoms, such as weight loss, lumps or swellings, or a persistent change in voice. If your GP is unsure as to what’s causing the cough, they may need to refer the case to a specialist for further assessment. This could include having a chest X-ray, breathing and allergy tests, or analysing a sample of phlegm to check for the cause of infection. How do I treat a Chesty Cough? Mild, short-term coughs do not necessarily require treatment. Typically, they are caused by viral infections, which tend to get better on their own within a few weeks. It is recommended to rest as much as possible and to drink plenty of fluids. There are medicines available that are designed to relieve the symptoms of a chesty cough; these are known as expectorants. Expectorants claim to increase the amount phlegm produced by the lungs, making the secretions easier to remove through coughing. Expectorants usually contain the active ingredient Guaifenesin or Ipecacuanha. Some chesty cough preparations can contain more than one active ingredient. For example, an expectorant may also contain a decongestant, such as Pseudoephedrine. Others preparations instead contain a painkiller, such as Paracetamol or Ibuprofen. These mixtures are designed to help ease the related symptoms that come from having a cough/cold, such as nasal congestion or aches and pains. Homemade cough remedies are likely to be just as effective as the pharmacy equivalent. Popular homemade cough remedies usually contain a mixture of glycerine, honey and lemon. Honey shouldn’t be given to babies under one year as it carries the risk of infant botulism. How can I prevent a Chesty Cough? A chesty cough is often the result of respiratory tract infection, which like the common cold, isn’t always possible to prevent. The best advice would simply be to live well. This will boost your immune system, giving you a better chance of staving off infections. Eating a healthy balanced diet that includes plenty of fresh fruit and vegetables. Ensuring you get enough sleep. Drinking plenty of fluids (especially water). If an asthma sufferer, ensure it is well controlled. If you find yourself suffering from either a persistent or recurrent cough, it is recommended to visit your GP, who will be able to identify or rule-out any underlying cause. How can I tell if my Cough is abnormal? Most coughs are a response to a cold, flu or allergies. This is normal; everyone will cough occasionally. If your cough is bringing up blood and/or mucus, this is abnormal and you should consult your doctor. Likewise, you should talk to your GP if your cough is causing you severe pain or making you feel fatigued or light-headed. Will medicine cure my Cough? Coughing itself is not a disease – it is an indication that something else is wrong with your body. For this reason, cough medicine will not address the cause of the cough. There are two different categories of cough medication: expectorants and suppressants. Expectorants are used to treat a wet cough, which may be due to a condition like bronchitis or pneumonia. The medication helps the cough to remove the excess mucus from the bronchial tree and lungs. Suppressants are used to ease a dry non-infectious cough. If there is a chance that your cough is due to another serious condition, you should be wary of using suppressants. This is because coughing is the body’s way of removing substances from the respiratory pathway. Which medications can cause a Cough? Some medications for high blood pressure (ACE inhibitors such as enalapril, lisinopril and perindopril) may cause a chronic cough. Should I seek medical advice? You should talk to your GP if you notice that your cough is causing you to expel blood or mucus, to have a fever, or to have difficulty breathing. These symptoms might indicate that you have a more serious problem than a cold or flu. One such condition is a chest infection, which may also cause a rapid heartbeat, wheezing, or disorientation. You should also see your GP if your cough lasts for more than three weeks, or does not improve after seven days of medication. What causes a Chesty Cough? When the respiratory system is working normally, the tissue of the lungs is lined with a layer of mucus (or phlegm), which prevents irritants from entering the lungs. These irritants include bacteria, viruses and dust. Coughing is the body’s mechanism of removing the mucus which has trapped irritants. This is why you have an excess of mucus and a chesty cough when you are fighting a cold. What should I do if I have a Chesty Cough? It is important to look after yourself. Staying rested will help your immune system to recover, and frequently washing your hands will stop the spread of germs. Another way to help your immune system is to ensure that you are fully hydrated. Water can also help to loosen mucus, and replenish fluids you have lost through your nose and mouth. If you are struggling to sleep, try sleeping on a slight incline. This will prevent mucus from reaching your throat, and help with congestion. Consider avoiding cigarettes and other forms of smoke. Smoke commonly causes irritation of the lungs. Tickly dry coughs occur due to an irritation of the throat rather than the lungs, which is why no mucus is involved. The irritation may be due to cold or flu infections, or common irritants including dust and smoke. Several allergens can cause a dry cough; if you think you are coughing due to an allergy, try taking antihistamines. Other conditions can cause a dry cough as well. One is asthma, which will also cause wheezing. Another is gastric reflux, in which case you will likely also be suffering from heartburn. In either case, you may want to talk to your GP. The mechanism of a dry cough can further irritate the airways, and cause a sore throat. So, you should try to soothe your throat as quickly as possible. What should I do if I have a Dry Cough? Along with suppressant cough medicines, consider using lozenges, hard sweets or even ice cubes to ease the irritation in the throat. Steam from a hot shower can moisturise the nose and throat. If, however, you suffer from asthma, steam may worsen your cough. If the air in your bedroom is dry, use a humidifier. Remove dust from your house and bedding. Dust is a common irritant, and dust mites can trigger allergies.